Courtroom technology has changed a lot in recent years, and it’s possible to receive the information you need almost instantaneously. For years, the standard process for court reporters was to transcribe the events taking place in the courtroom with stenographers and reporting equipment. Today, we have a range of real-time technologies that allow us to improve the court reporter’s transcription and provide better, faster access to the reports they generate. Previously, when a court reporter completed a report, it would need to be transcribed before the court or attorneys could access it. This process could take some time, and it wasn’t always finished when the parties involved really needed the information it contained. Today, that transcription still needs to take place. However, real-time technology has made it possible to transcribe the report while it’s happening and then make it available anywhere. These solutions continually process new data to create a rough-draft transcription that is immediately accessible. Real-time transcriptions offer two important benefits. First, it is fast. This system means you don’t have to wait for delivery of a court report. 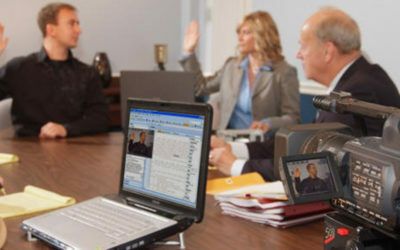 Second, the transcription can be input into the courtroom testimony program. 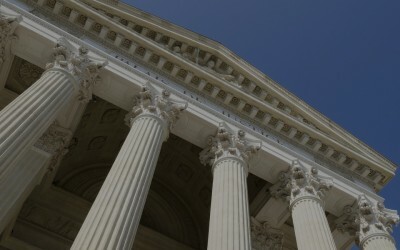 On top of all that, testimonies and court proceedings can be streamed online, in real-time, so that the proceedings can be accessed nearly anywhere in the world. Security, of course, is a big concern here, which is why these streams aren’t available for any person to simply access. But, when key players are scattered in different locations, this can be an effective solution that will keep everyone in the loop. In order to take down the proceedings of the courtroom, court reporters need to be able to transcribe at least 180 WPM. Stenographic equipment helps them achieve this. When real-time technology is included, the stenographic notes are converted through the technology into instant text. This text can then be distributed to the necessary parties. These transcriptions are projected instantly where they need to be viewed. They are also stored digitally, so once the report has been completed, the digital copies can then be used to turn the rough draft into professional transcripts for the court proceedings. Real-time technology enables immediate transcription of the proceedings of the court, which is great for attorneys and other parties that need access to the report. But there is a third benefit that often goes unconsidered. Immediate transcriptions of court proceedings can be easily followed by people who are deaf or hearing impaired. This is especially helpful in the courtroom when you have a jury member or audience participant who is hard of hearing. The proceedings are instantly viewable, which eliminates the need for a translator. Outside the courtroom, this technology is what makes closed captioning – a service that benefits one-third of the population – possible. The technology is widely used by television programs, sports broadcasts, webcast reporters, and news stations to make sure the information they share can be received by nearly everyone. Contact Us today to learn more about this service and how it can help your court proceedings.